Prices listed are only estimated costs, an exceptional kitten may be priced higher than the top breeder price listed. Kittens are held under breeder evaluation until 6 weeks, and are then offered as pets or breeders depending on their evaluation. Kittens evaluated as breeder quality may be sold as pets, however their price may exceed the pet price. * All of our kittens come de-wormed and microchipped, with a health certificate and their first and second set of shots (which is all they need for the first year). * A non-refundable deposit of $300 is required to be put on my waiting list for a pet quality kitten. * Down payments are not refundable. If you choose not to take a kitten after paying the down payment to reserve a kitten, your payment is lost. * Kittens are kept until at least 12 weeks of age. This ensures that the buyer is getting a well-socialized, well-adjusted kitten. By this time they are eating well on their own, using the litterbox, have had vaccinations started, and are mature enough to leave their first family. * If a kitten is sold as a pet, they will be spayed/neutered before going to their new home. At this time the registration papers will be supplied to the buyer. * Declawing of your cat/ kitten is NOT permitted under any circumstance. * Kittens MUST be kept indoors at all times unless contained in a secure cage or on a harness and leash. 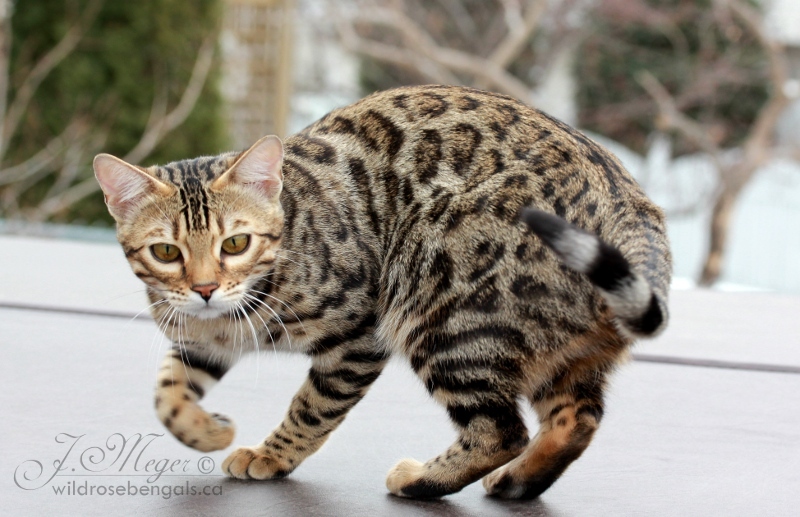 * Should the buyer not be able to keep the cat/kitten at any point in time, the cat/kitten will be returned to Wildrose Bengals. The buyer does not have permission to sell or give the cat/kitten away. * All kittens/cats purchased are guaranteed to be of sound health upon the date of purchase. Health is guaranteed for a period of 72 hours from the time the kitten leaves the possession of the seller. The kitten MUST be quarantined and have no contact with any other animals during the 72 hour period. It is recommended that you take the kitten to your veterinarian (at your expense) within this time period for your own satisfaction and protection. If the kitten is found to be medically deficient, it may be returned, and the purchase price will be refunded or replacement kitten offered as available. * Up until the kitten is 2 years old, if a vet certifies that any illness/death is due to a congenital defect, WildroseBengals will refund the purchase price, or replace it with another kitten/cat as available. * If the buyer changes his mind regarding the reservation of a kitten, no refund will be made, the deposit and payments will be permanently lost. *If the reserved kitten should die or have a problem of any kind preventing the sale, no refund will be made, the deposit and amounts paid will be deferred to another kitten. * We ''reserve the right'' to have a change of mind and keep a kitten for our own breeding program that has a down payment on it. In these circumstances you can either wait for another kitten or have your down payment refunded. If at any time during the purchase process we feel that circumstances have changed and you are no longer a fit for one of our kittens, we have the option of cancelling the sale and returning any money paid including the deposit.